Romance, Betrayal, Violence, Loss, Heartbreak, Resilience, Redemption, Forgiveness and Triumph With powerful insight and compassion, author Emily Frankel writes riveting fiction about strong, dynamic women who cope bravely and determinedly with the dramas of life. Rose, Karen, Hally, Ivy, Cordelia and Marian. 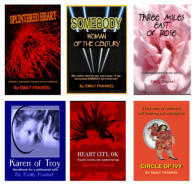 They are the powerful women who inhabit the novels of Emily Frankel. Loss and redemption. Survival and romance. Fame, fortune, conflict and disappointment -- Life! These are stories worth telling, and lives worth sharing as Emily Frankel takes us on rich journeys of human experience, making us feel for her vivid characters; inspiring us to care.